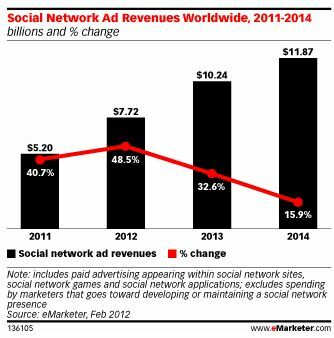 Worldwide social network ad revenues are still going strong and set to grow nearly 50% this year, according to eMarketer estimates. eMarketer forecasts advertisers will spend $7.72 billion on social network advertising this year, including paid advertising on social sites and in social games and applications. This year’s growth will be even faster than in 2011, though in 2013 and 2014 eMarketer expects growth rates to fall - but remain in the double digits. 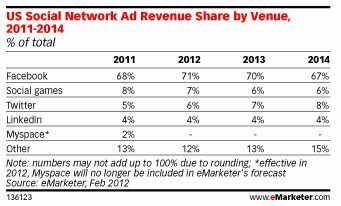 By 2014, eMarketer expects nearly $12 billion will go to social network advertising worldwide. Nearly half of that money currently comes from the US, and with just slight shifts during the forecast period, will continue to do so. This year, advertisers will spend $3.63 billion advertising on social networks in the US, up from $2.54 billion in 2011 and continuing to climb to $5.59 billion by 2014. While US growth rates will be slightly below the worldwide average from 2011 through 2013, in 2014, eMarketer expects US spending increases to outpace those in the rest of the world, thereby keeping the country’s share of total social network ad spending around half the worldwide total. Facebook is the recipient of most of these social network ad revenues, taking in around seven in 10 of all US social networking ad dollars throughout the forecast period. Twitter’s share, by comparison, will rise from 5% to 8% between 2011 and 2014. 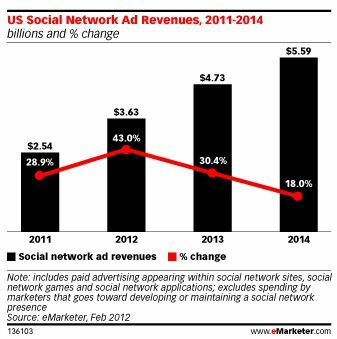 Meanwhile, ad revenues at other social networking sites will rise somewhat as a proportion of the total, moving up 2 percentage points between 2011 and 2014.